I was in New Jersey yesterday with Art, my NPR producer. We’re working on a piece, and normally I talk about whatever I’m working on, I don’t worry about anyone stealing my ideas, but for the first time I feel a little nervous because I just can’t believe we’re getting to do this piece and that it hasn’t already been done. I’ve seen one or two little things, but nothing major. And it’s absolutely, totally fascinating. I emailed my agent saying I think this should be the topic for my next book and she agreed. I will say that we visited the archives for Bell Labs as part of the piece. Next week I do my big holiday cleaning. I just love holiday cleaning. I could use some advice about something though. My apartment has had an odd smell for more than a month and it’s driving me insane. I thought it was gas, but the Con Ed guy came measured everything and said no. He thought it kinda smelled like gas but kinda not. Maybe something died in the walls, he suggested, except it’s not that bad. I don’t like the smell, but it’s just not a bad smell exactly. But maybe a small dead thing wouldn’t smell too bad? The smell has changed slightly for me, and smells less like gas now. It hasn’t faded, just changed. I don’t know what to do. I have sniffed every inch of my apartment and I absolutely cannot tell the source. Should I just wait and hope for the best, that it fades?? 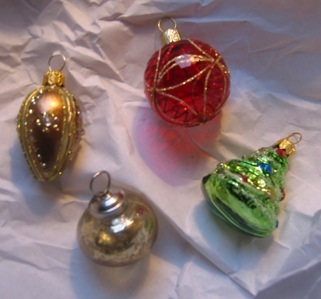 The picture is of a few new Christmas ornaments I bought myself in preparation for my holiday cleaning next week. I will put them up when I’m done. I broke the green one already. Stacy, we had a bad/odd smell in our home for several weeks. It turned out that one of the electrical sockets had burned up inside the wall. We were very fortuante that it didn’t burn the house down. Do you have a building maintenance person that could check that out for you? You and Finney and Buddy be careful! Thanks for the tip! I called the landlord and asked him to check. God knows if he’ll do anything, I don’t have the most responsive landlord in the world. Nadine, I definitely want to start asking around if it’s just me.